Bellator MMA is not only going head-up with the UFC tonight, but they’ll be doing so in the same state of Connecticut. 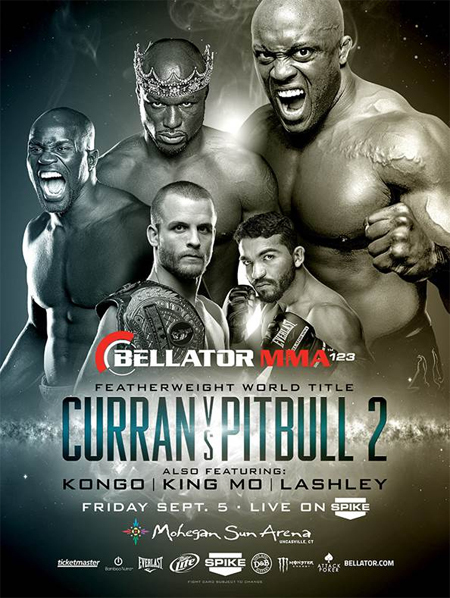 “Bellator 123: Curran vs. Pitbull 2” takes place Friday inside the Mohegan Sun Arena in Montville, just down the way from Foxwoods Resort Casino where UFC Fight Night 50 goes down. Featherweight champion Pat Curran defends his throne against Patricio Pitbull in the show’s featured attraction. Muhammed “King Mo Lawal” battles Dustin Jacoby in the co-main event. Stream the prelims live right here on 5thRound.com starting at 6PM ET/3PM PT. Spike TV airs the main card 8PM ET/PT. Phillipe Martins vs. Pete Rogers Jr.